The Atron series of Decorative Wallplates offers a wide variety of colours, styles, shapes, and finishes to suit any home decor. Long lasting, easy to mount and maintain, and an inexpensive way to add fashion. The perfect plate is available for every taste. Stylish for enhancing your home decor, finishing touches to match your Pewter fixtures and accessories with this Pewter Rocker / Decor style Switch plate. The Atron series of Decorative Wall Plates offers a wide variety of colours, styles, shapes, and finishes to suit any home dicor. Long lasting, easy to mount and maintain, and an inexpensive way to add fashion. The perfect plate is available for every taste. 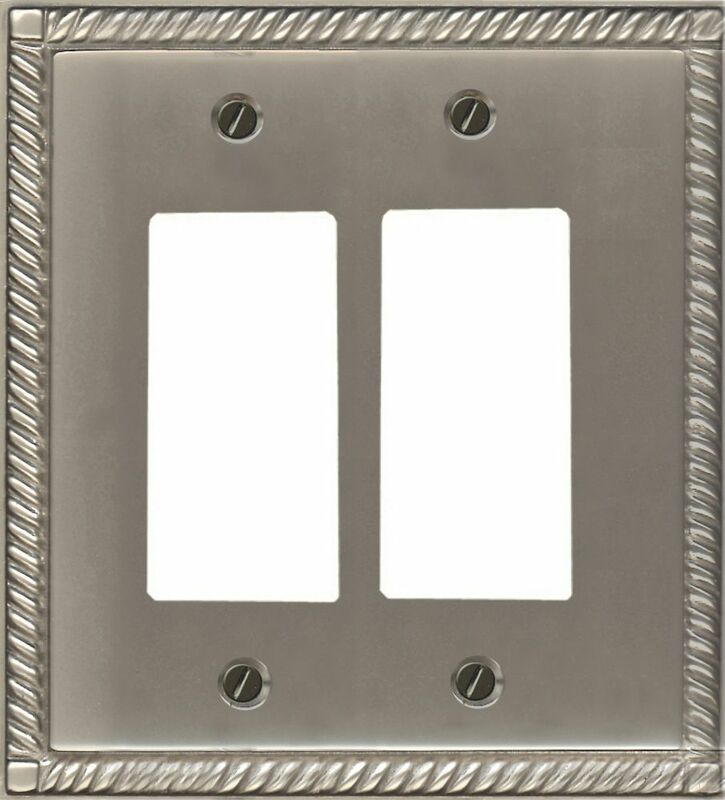 Match your Pewter finish Fixtures and accessories with this Rocker / Decor style Switch Plate. The Atron series of Decorative Wallplates offers a wide variety of colours, styles, shapes, and finishes to suit any home dicor. Long lasting, easy to mount and maintain, and an inexpensive way to add fashion. The perfect plate is available for every taste. Stylish for enhancing your home dicor, finishing touches to match your Satin Nickel fixtures and accessories with this Satin Nickel Double Rocker / Decor style Switch plate. Solid Brass Pewter Finish Double Rocker is rated 5.0 out of 5 by 1. Rated 5 out of 5 by Paul17 from Hard to find Could not find this product in any hardware stores but needed this model to match previously installed wall switch plates. I still had the manufacturer name and when I contacted them they directed me to the Home Depot site. I was surprised to find the product I needed still available and it was easy to order with free shipping.